Well folks, I'm discovering that being cooped up in the house this winter is not entirely a bad thing. I have lots of time for creating things that have been on my to-do list for quite some time, like this safety pin bracelet. This had been on my list ever since I found the tutorial over at My Favourite Things Blog. It's a bit time consuming to make, but not too hard. I'm just happy that I finally used up the seed beads that I've had laying around ever since I was a kid. What kind of string/thread did you use? I actually made one tonight, but had issues with my string and ended up doing something different. I've never actually seen a tutorial...I saw a picture of one and just decided to try to make it! Yours looks really good, by the way! This is cute. I would think that you could use elastic sting? thank you for sharing. This is such a great idea! I have a whole box of safety pins and have been trying to find something to do with them. We found you from the Six Sisters Blog Hop. This could be fun to swap with friends. We are hosting our first link party tomorrow and we would like to invite you to link up with us. We have a fun blog to co-host with us. Hope to see you there. Very cute! 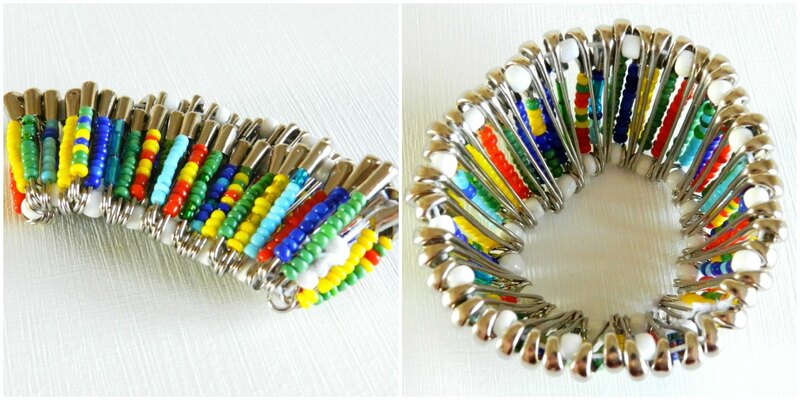 I love making safety pin jewelry! So many ways to make them look different.